On many occasions, you might lose important data from your iOS device, due to accidental deletion or an unexpected restore operation. But because of the way data is stored, there’s a good chance that you can recover those data, even after they are permanently removed from your device. Files that have been recently deleted have a higher chance of recovery, as they are less likely to be overwritten by new data. However, the case is different if you have just restored your device using iTunes; odds are that the process will overwrite your existing data. So, if your device is not able to boot up (e.g., stuck in recovery mode), your best bet for retaining the data is to avoid iTunes Restore. Instead, you can try these workarounds to get your iOS device back to normal with all the data and settings intact. But if you have already restored your iPhone, iPad or iPod Touch, or want to bring back some accidentally deleted data while the device is functioning normally, you can try these data recovery methods mentioned below. If you have a recent backup of your iOS device, the easiest way to recover deleted data is to restore it from that backup, which may either be available offline (iTunes Backup) or online (iCloud Backup). To fully restore your device from a backup, you can follow this official guide. 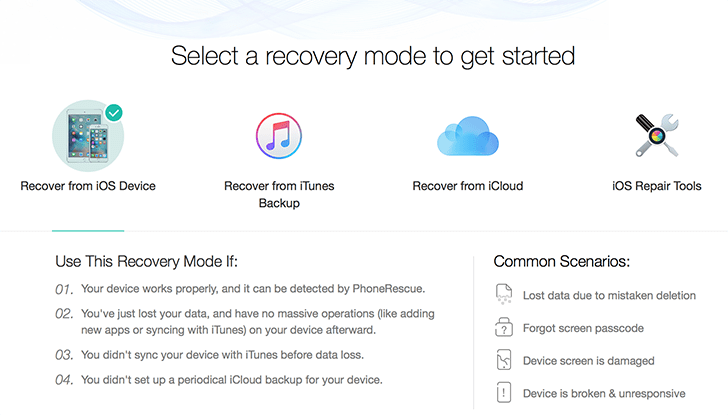 If you only want to retrieve specific content from an iTunes or iCloud backup, you can do so using third party data recovery solutions, like PhoneRescue. PhoneRescue is a desktop client available for Mac and Windows, with the ability to extract 25 different types of data – Personal Data (which includes Contacts, Call History, Messages, Message Attachments, Calendar, Notes, Reminders, etc. ), Media Data (which includes Photos, Music, Video, Ringtone, etc.) and App Data (which includes WhatsApp chats & attachments, Skype chats & attachments and media files stored within other app storage) – from iOS backups. Similar to PhoneRescue, Wondershare Dr.Fone also allows users to recover specific data from iTunes or iCloud backup. If you don’t have a recent backup of your device, you can attempt to recover deleted data by scanning your iOS device. If the deleted data has not been overwritten, third party iOS data recovery apps like PhoneRescue or Dr.Fone may help you get it back. Launch PhoneRescue and wait for it to detect your iPhone, iPad or iPod Touch. You might have to quit iTunes if it is already running. Select Recover from iOS Device and click on Next. Next, select the items (Photos, WhatsApp attachments, etc.) that you want to recover and click on Scan. PhoneRescue will scan the iOS device for deleted files. Once scanning is completed, it will return the list of recovered photos, videos and other files. Click on the Recover button to save them. Another iOS data recovery software called Dr.Fone from Wondershare, also provides similar data recovery features. However, PhoneRescue can recover more than 20 different types of data from iOS devices, which makes it much more superior to Dr.Fone in terms of data recovery. Both PhoneRescue and Dr.Fone are paid applications. While PhoneRescue allows you to try out all the features before purchasing, most of the premium features of Dr.Fone are unavailable in trial mode. Still, both these data recovery solutions are handy tools to have in case some deleted data need to be recovered from your iPhone, iPad or iPod Touch.